It wasn’t until pregnancy and post-partum insomnia ‘forced’ Kate Northrup to ‘take a break’ that she saw how valuable doing less could be for business (and life). Doing the same thing over and over again and expecting a different result is the globally recognised definition of insanity. Yet we continue to expect stress, anxiety and mental health problems to melt away whilst being infatuated with ‘busyness’. And, it’s costing us our health. Women, in particular, are more likely than men to experience work-related stress, anxiety and even increased depressive symptoms. Partly due to the additional roles they take on to bridge home and work life. It’s clear the way we are working is, no longer working. 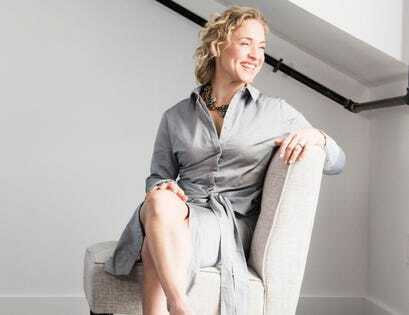 Best-selling author, entrepreneur and mother to two kids under the age of three and a half, Kate Northrup, says she’s all too familiar with these pressures of busyness and resulting depletion. She grew up believing ‘doingness’ was next to ‘godliness’ and felt that productivity was what made her valuable. A mindset that most entrepreneurs, business leaders, mothers, and ambitious women share. The way we work in our culture is as though we’re in a perpetual harvest. But anyone who’s grown anything in the earth knows that this is impossible … Focus on quantity and growth above quality and sustainability leaves the soil depleted. Focus on these very same deliverables leaves humans depleted. Kate is posing a counter-intuitive approach in her latest book, released today, Do Less: A Revolutionary Approach To Time And Energy Management For Busy Moms. Integrating lessons in business, energy management, motherhood and living with the cyclical nature of our lives, she is teaching women globally how to not just do less and achieve more, but to live with more meaning, presence and joy. It’s not often you can pick up a book that could just as easily be categorised as Self Help, Spirituality, or Business and Marketing. Kate’s advice is practical, data-backed, witty and above all else heartfelt. Having run her own businesses since she was 18 years old and grown an online community of over 250,000 members globally—you could say she knows ‘busy’ well. It wasn’t until her first pregnancy in 2014, as well as suffering from postpartum insomnia, that the brakes came on for the first time and they came on hard. For two years she says she worked half of the time, if not a quarter, of what she ever had up until that point. Kate Northrup now works on average 20-25 hours per week, whilst business revenue continues to grow. Stressed her business would collapse if she took a break, instead, she was surprised that business revenue remained steady. And, after implementing the Do Less way more consciously, even grew. There are many studies that attribute regular breaks to increased productivity and profits, as well as physical and mental well-being. Kate now works on average 20 to 25 hours per week and says the company she runs with her husband, Mike, is about to close its first-ever seven-figure year. When stress rises, the need to feel in control rises too. Often that leads to reaching for the time management tools to cram more in to already loaded to-do lists. Which only leaves you feeling more depleted. None of these tools sync with your uniqueness—including your precise lifestyle and appetite (or lack thereof) for burn out. Do Less teaches, possibly for the first time ever, how to sync natural cycles with energy management and business productivity. Kate says managing our energy is a much more sustainable pathway to success. The ‘experiments’ she shares in the book give readers practical ways to identify how to replenish your energy—from aligning with feminine cycles, to getting clear on the ‘vital few’ activities in business that give you results and, getting clear on what’s most important to you. Members of Origin Collective, Kate’s monthly membership site, shared with me that by managing their energy (instead of their time) they’ve experienced anything from increased output (in the same amount of time) to reduced stress, being able to plan maternity breaks, feeling more energetic, and making more money. The modern workday leaves little room for rest and recovery, which is at odds with the way the women’s bodies and energy operate (and how nature operates too). Men naturally replenish energy in 24-hour cycles. Yet the feminine cycle is 28-days, with four distinct phases, each with hormonal changes that directly impact mood, energy and creativity. The four phases of the feminine cycle mirror nature’s seasons and even the cycles of business projects. These phases also exist within nature, through the seasons of the year, and business projects. The phase most people skip is that period of rest that calls for slower physical energy, and more internal review. This is vital for our ability to counter the effects of prolonged stress and restore balance, as it allows our nervous systems to move from high-alert to ‘rest and digest’. Kate refers to this period as “the fertile void” and says by honouring its gifts you can access heightened clarity and creativity in your business (and life). The point is not to fit more into our days. The point is to fit more of ourselves into our days.